In India diabetes is not an unfamiliar term these days, the incidence of diabetes is rising at an alarming rate. What is diabetes? A metabolic condition where in the blood sugar levels rise above the normal count is one of the simpler explanations for diabetes. However there are many other implications and effects of this disorder one of them being a low insulin count. With a steady rise in the count of diabetics across the globe, the diagnosis of it is a wakeup call for most people. It is very important for a diabetic to lead a healthy and balanced life style and that is where food plays a very important part. We put down a couple of dos and don’ts to keep your blood sugar count in check and live a life that is not controlled by diabetes. These little things may make a big difference to your life! Eat fibre rich food like wheat bran, oats, green peas and bitter gourd to make up for the lack of other vitamins and minerals. Include fruits with less natural sugar in your diet. Fruits like papaya, guavas and apples are great for diabetics. Eat small meals at regular intervals as an erratic meal schedules results in erratic blood sugar levels. Avoid eating starchy saturated food, packaged food that contain transfats and foods with high sugar content. Avoid drinking and smoking as much as possible. However an occasion glass of wine here and there should do fine only if your sugar level permits. Work out regularly and religiously as maintain a slim and fit body is very essential to control diabetes. Be aware and updated– Stay informed about your condition. The kind of diabetes you have, simple things you can do to improve your condition and most importantly regularly monitor your blood sugar levels. Never skip your daily dose of medication. Maintain a food journal and keep track of what you eat and when. This will do you more good than you can think. The symbol for Worlds Diabetes day is a blue circle. The symbol goes perfectly well with the message for the day. In several cultures across the world a circle is a representation of life and good health. The colour blue is the colour of the United Nations flag and signifies the sky that unites us all. Hence this blue circle symbol aims at uniting people worldwide to successfully overcome this pandemic! We are doing out bit by giving you some recipes that will help you keep diabetes in check without missing out on some lip smacking delicious food and some great recipes ! Oats with dried fruits - How to make Oats with dried fruits. Masala missi roti - How to make Masala missi roti. Besan Methi Frankie - How to make Besan Methi Frankie. This recipe is from the book Khazana of Indian Recipes. Learn More About Autism this World Autism Day! 5 foods that boost women power! 5 Energy boosting food for Navratri! Maharashtrian Snacks – there’s something for everyone! Easter – symbolism and celebrations! Jamva Chalo Ji – Parsi Food. Energy boosting food for women on the go! The real Halloween haul – pumpkin seeds! Bakri Eid dawat – mutton mania! Top 10 Traditional Holi recipes with a twist! Table for two – Rev up the mush! 5 brilliant Christmas menus – planned for you. 9 payasams to make Onam a hit! Made with love, Made by Ma. 7 ways to make Holi more fun! 6 Party starter recipes to get you started! How to celebrate Guru Nanak Jayanti! ….and your favourite Diwali food memory is? Shree Ganesh to the food festivities! Sandwiches– why the world loves them! No onion no garlic? So what! It takes up to 2 minutes for the activation mail to arrive. 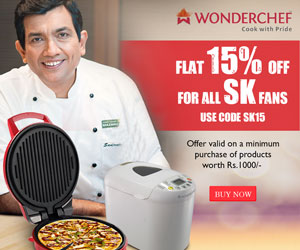 Hello, your account with www.SanjeevKapoor.com is yet to be Activated. You will be receiving intimation on your registered email address. Kindly confirm your registration by clicking on the link provided in the mail. Your login details would continue to remain the same post activation also.